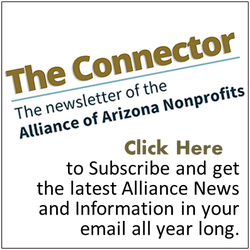 Nonprofits and industry professionals play vital roles in educating and collaborating to advocate for our causes, programs, and clients. After learning "Advocacy Basics" and easy tools to help you become a better advocate, take it to the next level and develop an advocacy plan for your organization by assessing where your funding comes from and determining which elected officials influence your organization. Even with minimal advocacy knowledge or capacity, building an advocacy plan for your nonprofit enhances your voice, allows you to become an even better advocate to show your impact in our community. David Martinez III oversees the government relations of St. Mary’s Food Bank Alliance to secure food for clients and funding for on-going operations through critical government nutrition programs. Originally from Marana, Arizona and one of six children, David began working at St. Mary’s in 2010 to expand child nutrition programs for children at risk of hunger. A fellow of the inaugural class of the Flinn-Brown Civic Leadership Academy and the inaugural class of the Feeding America Advocacy Academy in partnership with the Congressional Management Foundation, David previously has worked as a community organizer and state lobbyist, and served from 2007 to 2009 on the Arizona Board of Regents. As a first generation college student, he earned a Bachelor of Arts in Secondary Education, Political Science and Journalism from the University of Arizona and worked at the UA Office of Institutional Equity as well as an intern with Congressman Raul Grijalva.